CCE, the reliable solution provider in various engineering software, just launched EnSuite software that can be applied to view and convert 3D CAD data. The EnSuite is mainly used to convey and leverage cad data to everyone belonging to outside of engineering/design which range from sales/marketing, purchasing, quality, estimation, manufacturing, packaging, and customer service and others. Viewer application is improved as the users now will be able to open, view, and convert models generated through SOLIDWORKS 2015 and Parasolid v27.0 as well as export any CAD model to the Parasolid V27.0 file. View all the most important native CAD, Standard formats and Visualization and Point Cloud files under one viewer, self-governing of the source CAD system. Evaluate and query data instantly from CAD files through simple easy-to-use productivity tools ranging from distance measurements, calculating mass properties, bounding volumes, BOM, and lots other. Distribute any CAD Files, Markups, and reports with your extensive enterprise, with the help of top-notch translators, collaboration tools, and a 3D PDF generator. 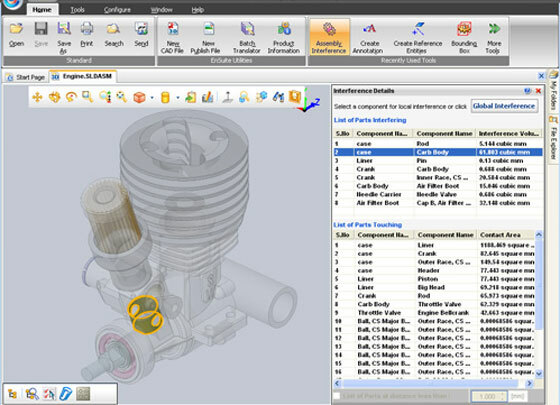 You can computerize designs, processes, incorporate internal systems, and combine PDM/PLM/ERP. The users will get the ability to view and transform part and assembly documents generated through ACIS, Rhino (.3dm), and SketchUp (.skp, .skb) formats. User experience becomes better as the user-interface now supports any monitor resolution. The users having active subscription, will be capable of accessing the software at free of cost. Download the 5 days free trial version.